I was having dinner with a friend the other night who is not Christian but who was asking me a lot of questions concerning what our Catholic faith is all about. When I explained it to him, he said I pretty much captured it in a nutshell. Since he found it helpful, I thought it might help someone else by posting it on my blog, so here goes! With Original Sin, Heaven was lost to mankind. Satan had his entry into our world, and with him came his greatest weapon: death. No matter how good any one of us tries to be, because of Original sin, when we die, we would enter into Hell and condemnation for all eternity, and there was nothing we could do about it. A good image would be of us being thrown into a prison and shackled to the wall with the door slammed shut behind us. With Satan, all our pleading and begging for mercy to let us out falls on deaf ears. The only one who can help us is God. We need his help; without him we’re doomed. God did come to our help by becoming a man. He took on our human nature precisely so that now he could enter the realm of death, something he couldn’t do as God alone. He took on flesh in the person of Jesus, who is both truly God and truly man. When he died on the cross – which was his plan from the beginning – he was able to enter into Hell and free us. You can imagine it as Satan letting the one person in who had the key to our shackles and the gate to Hell. When he rose from the dead, he destroyed death’s hold over us. It’s as if Jesus paved a highway that goes right through Hell and up to Heaven. So Jesus totally reversed the power of death by taking Satan’s prime weapon and turning it against him. What Satan intended as the means to enslave us in his kingdom – death – is now the way we leave his power and enter into heaven. We will still die, but death now leads to our salvation and not our condemnation. But in order for us to follow the path, we have to be one with Jesus. God took on our nature, and now we must take on his. This is accomplished through the Sacraments. In Baptism, we die with Christ and are buried with him, but we also rise with him. We inherit heaven and become heirs with Christ to everything he won by his death. In the Eucharist, Jesus gives us his body and blood as our food so that our flesh is now made up of his flesh, and every time we celebrate the Holy Sacrifice of the Mass and receive Jesus in Holy Communion, we are on the cross with him in an unbloody and painless manner, are buried with him and risen in him over and over again. It’s as if Jesus created a power line that transverses eternity for us to plug into his death and resurrection and receive the salvation he won for us once and for all. He made the sacrifice he offered on Calvary forever present to us in the Holy Mass. 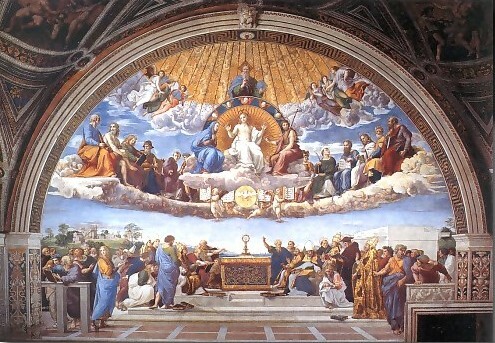 He also gave his teachings to the Apostles with the authority to continue these Sacraments for all of time, and told them to “teach them to carry out everything I have commanded you.” (Matt. 28:20) We still have to walk the path to heaven – there is no moving sidewalk that automatically takes us there – and sometimes, because while Baptism washes away Original Sin, concupiscence (the inclination to sin) still remains – we stray from the path. Christ calls us back to the right path constantly through the Sacrament of Reconciliation, and teaches us through the Church, especially the successor to St. Peter (the Pope) to whom Jesus gave the ultimate authority to speak in his name (cf. Matt. 16:13-20), to help us know when we’re not sure if certain activities or beliefs lead us to heaven or not. So, in order to reverse the effects of Original Sin, we must accept Jesus as God-made-man, be baptized, receive him in Holy Communion every Sunday for the forgiveness of our sins, and allow him to keep us on the path to heaven by following the way he shows us through the teachings of the Church. Do that and you’ll get to Heaven. It’s as simple as that! P.S. Thanks, Joe, for the inspiration!! Is the United States ruled by the Constitution or a dictator? President Obama’s attempt to wield his pen like a hammer and crush our First Amendment Freedom of Religion should be a wake-up call for all Americans. This November more than ever in our history, the First Amendment of the United States’ Constitution is being put to the test. We as Catholics have never voted as a solid bloc, but I feel this year we must. While there are many issues of concern that face our nation, the decision by Obama and others in Washington to ignore the First Amendment Freedom of Religion clause and force us to provide contraception coverage in our Catholic institutions should lead every American to shudder! If the Obama Administration is allowed to squash the First Amendment, which Right is next to fall? (Actually, Obama has already attempted to squash Freedom of Speech by advocating “no protest zones” any time he or the Secret Service should deem that protesters are “threatening” – without defining what constitutes “threatening”.) Today, Cardinal Dolan announced a series of lawsuits against the Obama administration’s attempt to violate our TRULY constitutional right of Freedom from government intereference in our beliefs. We MUST put the preservation of the Constitution above any other concern. Please view the attached video and vote this November for the Constitution.